“Too Tired To Cook” Enchilada Casserole is a great throw together weeknight night recipe. Use rotisserie chicken, and don’t bother roll up each enchilada! 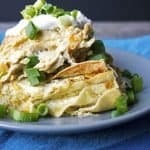 Mix together the shredded chicken, garlic powder, salt, pepper, cream cheese, 1 CUP SALSA VERDE, sour cream, and green chilis. In a 9×13 dish pour 2-3 Tablespoons of salsa verde and spread around to cover the bottom of the dish. Place 4 tortillas in the dish. Then pour ⅓ of the creamy chicken mixture on top of the tortilla. Sprinkle 1/2 cup of cheese on top of the chicken. Place 3 tortillas on top, and pour on about ¼ cup of salsa verde. Repeat the whole process by placing the chicken, then cheese, then tortillas, and then salsa. You should be able to get 3 layers. Finish the casserole with salsa and cheese. Bake the casserole for 30 minutes.